Agency is all the buzz these days on Martha's Vineyard. For years, the consumer has been lead to believe "My Realtor is my best friend". I feel this statement has been rather misleading. For one thing the term REALTOR® applies to a designation given to a real estate professional who agrees to adhere to adhere to a strict Code of Ethics. Many a time consumers have purchased property on Martha's Vineyard only to learn after the fact that they did not get the best deal. This is because prior to mandatory disclosure the agent working with the buyer was the seller's fiduciary, not the buyer's. The National Association of Realtors (NAR) and the Massachusetts Board of Registration of Real Estate Brokers and Salespersons set out in the mid-80's to correct this misconception and in 1990 implemented the Mandatory Agency Disclosure - Agency Relationship Form-705 as a way to ensure that there is no misunderstanding. The agent you select when you want to explore purchasing a property is required by law to inform you that he / she is either a Seller's Agent or a Buyer's Agent, or could work as a Disclosed Dual Agent. What does all this mean to the buyer of Martha's Vineyard real estate? Don't you want the same kind of representation as a Martha's Vineyard real estate buyer? Well, you can have it --- or can you? BUYER'S AGENT: When a buyer engages the services of a real estate agent, in theory, the buyer becomes that agent's client. This means that agent represents the buyer. The agent owes the buyer undivided loyalty, utmost care, disclosure, obedience to lawful instruction, confidentiality and accountability. The agent must put the buyer's interest first and negotiate for the best price and terms for his/her client, the buyer. (The buyer may authorize subagents to represent him/her in locating property.) However, unless there is a written contractual agreement between the buyer and the real estate agent the way there is between a seller and their listing agent, how sincere can this relationship be? Remember, the Mandatory Agency Disclosure is not a contract. Now we come to what I consider a curious form of representation and one that implies no representation at all and minimal assistance --- not a good idea in a complicated and diverse market like Martha's Vineyard. DISCLOSED DUAL AGENT: A real estate agent can work for both the buyer and the seller on the same property provided such agent obtains the informed consent of both parties. The agent is then considered a disclosed dual agent. The agent owes the seller and the buyer a duty to deal with them fairly and honestly. In this type of agency relationship the real estate agent does not represent either the seller or buyer and they cannot expect the agent's undivided loyalty. Also, undisclosed dual agency is illegal. The agent may know personal information about both the buyer and the seller, but as a disclosed dual agent is bound not to reveal that information to either party. I think that's a difficult line to follow and creates a serious conflict of interest. The dual agent cannot provide undivided loyalty to both clients. The duty of confidentiality to one compromises the duty of full disclosure to the other. 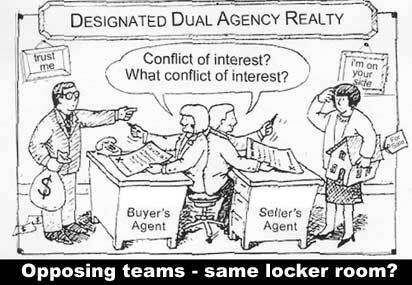 It is very important that you to have a good understanding of the (Disclosed) Dual Agency relationship, so I suggest you read a little more to learn about Avoiding Dual Agency. DESIGNATED AGENCY: This is a brokerage practice used when the brokerage is representing both the buyer and the seller. NAR has recommended designated representation since 1992 as an alternative to dual agency. Designated representation, sometimes called "designated agency" or "appointed agency," enables a managing broker to designate, or appoint, a buyer's representative and a seller's representative within the same company to work on the same transaction. The managing broker is like the line coach who holds the playbooks for both teams --- they can control the game. The broker has the responsibility of supervising both licensees, but the designated agents are expected to give their respective clients full representation. The hope and purpose for this type of agency is that it would avoid the problems of Dual Agency. (Are there problems with dual agency? Hmmm.) However, the idea that a brokerage can transfer the agency relationships created by the contractual representation agreements it has with consumers to licensees, who are agents of the brokerage and not the consumer, just doesn't make sense to me, and I don't think it will hold up in court. Some critics say designated agency tries to reduce the agent's liability by reducing service to the consumer, but designated representation doesn't alter a managing broker's responsibility for the licensees or the transaction. I think that Designated agency is merely a disguise for undisclosed dual agency. It is a deceptive practice very similar to the conflicts of interest and self-dealing recently exposed in the investment-banking and insurance-brokerage sectors. I don't know of one Martha's Vineyard real estate agency that practices designated agency, because they realize how prickly this kind of representation can be. The only hope for this practice to be successful is in a really big real estate agency with dozens of agents. So, if Designated Agency is too prickly, why then are brokers willing to practice dual agency? We've already said they're pretty much the same thing. The answer is because they have no choice under today's new agency law. Under all the confusing labels, what has really changed? The only real change is that we now have 100% Exclusive Buyer Representation, and you are also starting to see 100% Exclusive Seller Representation. Now, that makes real sense because each team will have their own locker room and coach. In a recent independent survey conducted by Harris Interactive, fifty-two percent of the nation wide respondents said that a dual agent, who is an agent that represents both the buyer and seller in the same real estate transaction, "cannot effectively represent (the) financial interests of buyers and sellers." A Dual Agent, as one person, cannot act in the best interests of both Buyer and Seller in a transaction because Buyers and Sellers inherently have conflicting interests: One obvious conflict arrises because Buyers hope to pay as little as possible for a property, while Sellers expect to receive as much money as possible for the sale of their property. TRANSACTION AGENT: You now know the difference between Disclosed Dual Agents and Designated Agents, and you know that only Exclusive Buyer Agents can provide 100% fiduciary representation to Buyers. But yes, there is another form of Agency which is really non-agency. A Transaction Agent represents neither the Buyer nor the Seller. Transaction Agents are ‘Facilitators’ who do not serve in any fiduciary capacity to either Buyer or Seller in a transaction; they simply work to facilitate the transaction. They shuffle papers. They have no contractual obligation to represent anyone, except themselves. If you as a Buyer do not have a written Representation Agreement with a real estate licensee, do not fool yourself into thinking you have a fiduciary relationship with that licensee – you don’t! Even though the consumer should now have a clear understanding as to the different types of agency, and is able to request and get representation from the agent they select, do all buyer's agents offer the same level of service? The answer is, "No they cannot". Only with an EXCLUSIVE Buyer's Agent can you be assured that your relationship will remain intact throughout the Martha's Vineyard real estate buying process. Is an EXCLUSIVE Buyer's Agent different than a Buyer's Agent (Read here)?